The classic tale of optimism and hope, the story of The Little Engine That Could was released as an animated DVD premiere movie on March 22, 2011, and distributor Universal Studios Home Entertainment is giving 50¢ from each DVD sold to The Starlight Children’s Foundation. The children’s story, which has been told in a variety of picture books , tells of a little train that’s carrying toys for good boys and girls when it’s confronted with a seemingly impassable mountain. The Shiny New Engine and the Big Strong Engine refuse to take the cargo over the mountain, but the Little Blue Engine overcomes the odds to get the toys where they need to go. The new movie, from the production company behind Alpha and Omega, features the voices of Whoopi Goldberg (Toy Story 3), Jamie Lee Curtis (You Again), Patrick Warburton (Bee Movie), Brenda Song (The Social Network), Corbin Bleu (High School Musical) and Alyson Stoner (Step Up 3D). 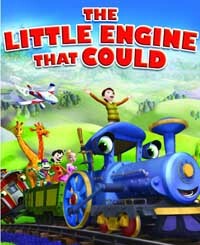 The Little Engine That Could also will be available for digital download.